Sustainability is an integral part of how we do business in Ramboll. In 2018, we reached an important milestone, as 55% of our revenue directly contributed to the UN Sustainable Development Goals. The key role of sustainability is also reflected in our annual reporting. This year, for the first time in Ramboll’s history of Annual Reporting since joining UN Global Compact in 2007, instead of publishing Sustainability and CR progress in a separate Corporate Responsibility Report, an integrated report featuring both financial and non-financial data has been produced. Under the headline Partner in Sustainable Change, the report delivers data and insights on all parameters that are relevant to our four central stakeholders: Clients, People, Company and Society. While the Ramboll Group further improved revenue in 2018 and significantly strengthened its international presence with a major US acquisition, it also delivered important milestones on the path to reaching its time-bound sustainability targets, set to be reached by 2020. In Ramboll, we have identified five focus areas and KPIs for our sustainability performance. The first four of the five targets are related to what actions we take internally in Ramboll to contribute to more sustainability. The data relating to these four targets has been externally assured by PwC. The fifth target relates directly to our revenue. This year, we reduced CO2 from energy consumption in our offices by -40% (in 2018 compared to the baseline 2016) through several initiatives; for example, we have increased the share of purchased renewable energy. We have also optimised the number of offices and office spaces per employee, increased awareness of measures to reduce energy consumption and pursue to select offices with lower energy consumption. However, CO2/FTEE (FTEE = Full-time employee equivalent) from air travel increased by 46% (compared to 2016), and we are in the process of identifying measures to address this serious challenge to meet our target of 20% reduction per employee by 2020. Overall, the total CO2/FTEE has decreased by -3% (compared to 2016). In 2018, we experienced increasing demands from our clients across our markets to deliver measurable sustainable solutions. In Buildings, interest in certification schemes from clients is increasing, as are our services to make buildings more healthy, sustainable, smart and energy efficient. 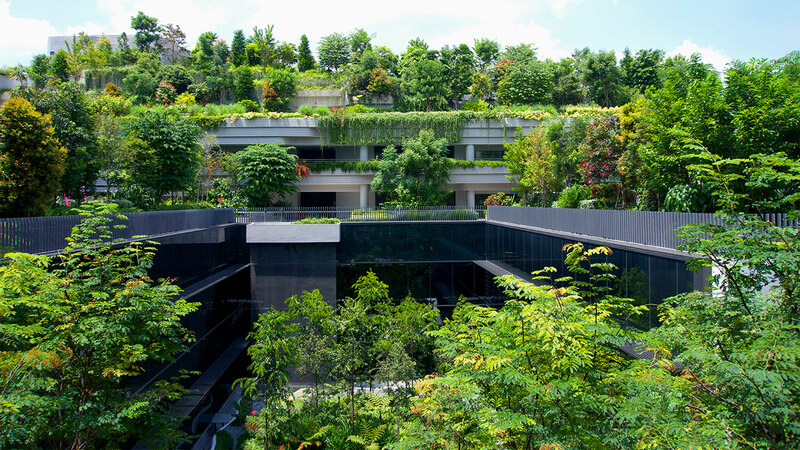 Many of our clients view national building codes as a point of departure for new developments and seek partners such as Ramboll to fulfil their sustainability ambitions. Similarly, our markets within urban solutions are developing positively. This year, we launched our Smart Mobility Spearhead which, together with our expertise within climate adaptation through blue-green solutions, plays a central role in our global sustainable city ambitions. Ramboll actively contributes to the UN Sustainable Development Goals (SDGs) and they influence not only the way we engage with clients, but also the way we work. Ramboll conducted an SDG market portfolio assessment in 2017 (for 2016 results). The assessment explored the 169 SDG targets for each of our markets and examined whether our services contribute directly or indirectly and had a positive or negative impact. Based on the assessment, Ramboll makes a directly positive contribution to 54 of the 169 SDG targets. In 2018, the positive contribution to the SDGs was DKK 6,214 million or 55% of Ramboll’s total revenue. 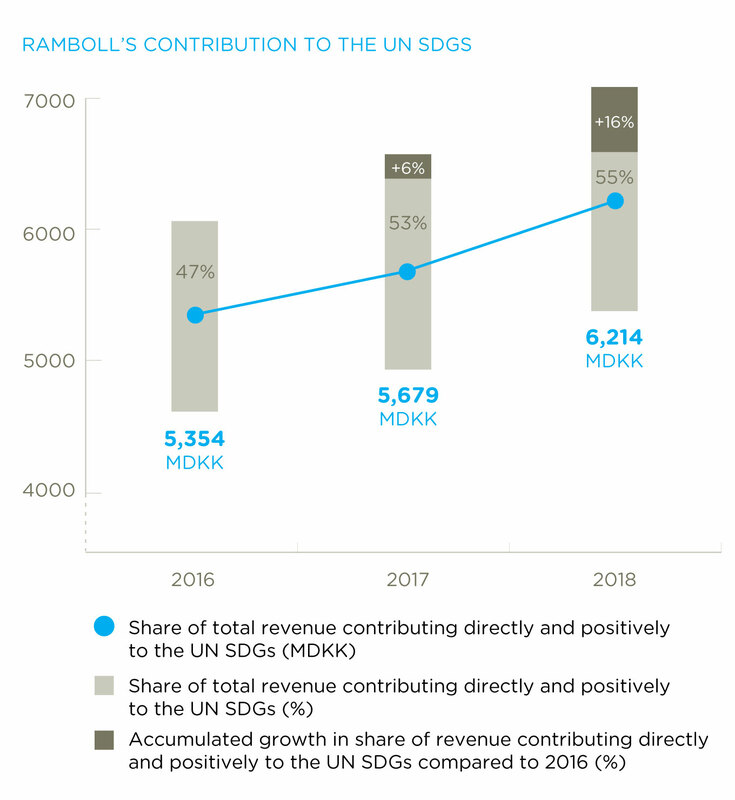 In 2018, Ramboll increased its revenue from services contributing directly and positively to the SDGs by 16% compared to 2016. We have procedures in place to reach our target. Some SDGs already have a strong market relevance across Ramboll, some provide significant market opportunities, and some contribute on a smaller scale with room to grow. Which SDGs can Ramboll impact? As part of our strategy to become a recognised leader for sustainable solutions, we use the 17 UN SDGs as our yardstick for sustainability. The SDGs, and their 169 underlying targets, are drivers for future investments and define our global priorities and aspirations. To focus the company’s effort and ensure market relevance, an assessment of which SDGs are most relevant to Ramboll’s existing business, which SDGs represent new market opportunities and which SDGs will be part of the design of all Ramboll’s future sustainable solutions.